The slogan of Panel Bucks is “The Buck Starts Here”. But is the really true or is Panel Bucks a scam to stay away from? I have tested the site myself and compared it to other online survey options. In this Panel Bucks review, I will show you what you really get. Let me just reveal right away that it is NOT one of my favorite survey options. But let me show you inside and explain what you get, and then you can judge for yourself. What is Panel Bucks and what does the site offer? When I first came to panelbucks.com, it seemed very familiar. The site looks more or less exactly like a few other panels I have reviewed in the past called SaySo4Profit and Panel PayDay. Since there is no info on the sites about who is behind, it is difficult to say if it is the same people behind. During my research, I, however, found indications beyond the look of the sites that indicate it is owned by the same people. But what is most important for you to decide if it is a good survey opportunity or not, is to know what it offers you as a member. From just taking a quick look at the site, it looks like any other survey panel. It says you can get access to daily paid surveys and it is free to join. What Panel Bucks says it offers. That sounds great and I love testing new sites that have this opportunity. On the sign-up page I, however, also spotted something that made me a little suspicious. It says you get a $25 sign-up bonus opportunity. You can supposedly get a $25 bonus opportunity. This is an unusual high joining bonus for a survey site. Also, that it calls it an opportunity made me suspicious about what that actually means. I quickly found out that the joining bonus might not be such a great opportunity after all, and I also found out that joining did not really give direct access to paid surveys. This does not mean you cannot get anything at all out of joining. But I just do not think it is very clear what to expect from just looking at the sign-up page – especially if you are new to taking online paid surveys. Let’s, therefore, look into what you really get so at least you know what you are getting into if you decide to join and can make an informed decision. I have created a video that gives you an inside look of Panel Bucks so you can see for yourself. You can also read all the details below the video. Since I have tested A LOT of survey sites, I was a bit suspicious before joining Panel Bucks as I spotted some things that made me suspicious. What I suspected turned out to be true. That is that Panel Bucks is not as such a survey site where you can earn by taking surveys on the site itself. It is what is called a survey aggregator which means it just gives you access to a list of survey sites you can then go and join. Sites like this can be helpful, but in my experience, they, however, rarely are, as most of them just give superficial info and are not focused on showing you the best opportunities but just on promoting what pays them. So let’s look at what kind of aggregator Panel Bucks is. The first you need to do is fill out a short sign-up form. Then the next step gives a good indication of what the panel offers. You get to a screen with offers from partners. After signing up, you get to several screens with partner offers. Nothing wrong with having partner offers on websites. Most website owners have partners in some ways to be able to cover the cost of running and developing a website. I have that myself as well – if not, it would just not be possible for most website owners to keep them running. However, before you sign-up it might not be clear what you sign up for. You get to a screen where you can see several offers. You have to go through 6 screens with offers before you can finish the sign-up process. Many of them do not even have anything to do with paid surveys and are offers for, for example, credit options, etc. In my opinion, the offers are not very relevant for what you might expect when signing up for a survey site and it is a lot to have to go through 6 screens of offers. When you finally get to the end, you are told you have to confirm your email to get access to the members area. So if you check your inbox you will have an email with a link. The confirm link took me somewhere else than expected. So I clicked the link to confirm – guess what? I was taken to another offer from one of their partners and not to the members area. It turned out there was a small link at the top of the email to actually confirm my membership but the main link in the email was to an offer even though it said it was to confirm. This, to me, already showed that the focus was not on quality and us as users but on promoting as much as possible. As already mentioned earlier, Panel Bucks is a survey aggregator and that means the main thing you can find in the members area is a list of other survey sites you can then go and join. You get access to a small list of sites you can join. The list is very small (was around 10 sites when I joined), you do not get a lot of info that can help you find the best options for you, and they promote quite a few very poor survey sites that are just a waste of time, in my opinion. There definitely are a few good sites on the list, but most of them are just not worth it. 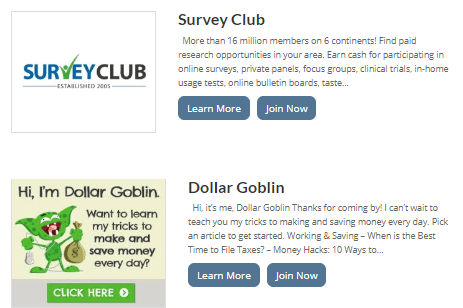 They are, for example, promoting a site like Survey Club as a way to earn cash by participating in online surveys. But in fact, Survey Club is just another survey aggregator. They are also promoting another aggregator called iSurvey World. This means that you have to join Panel Bucks to get access to a short list of actual paid survey sites. When you then follow their recommendation, you might think you can earn on one of the sites mentioned above and go there to sign up. They are then also just giving you access to a list of survey sites you have to go and sign up for. 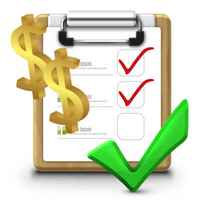 This can make it a very long process to ever get to the sites where you can actually earn if you do not have a lot of experience with paid surveys and cannot quickly spot which sites are actually paying you to take surveys and which ones are just giving you access to offers they promote. Before you sign-up for Panel Bucks, there are big letters saying you get a $25 bonus opportunity, as mentioned earlier. Well, in a sense it is completely correct that you do get a bonus opportunity. But if you look at the small writing at the bottom of Panel Bucks’ website you can see what this actually means. The small print explains what the bonus really is. It here says that some survey sites offer joining bonuses. If you join some of the actual survey sites that have a bonus like this, you might be able to earn $25 bonus in total if you join enough survey sites. It is definitely true that some survey sites offer joining bonuses. A site like Swagbucks, for example, offers a $5 joining bonus and so does a site like PointClub. So in that sense, it is true that you get a bonus opportunity by joining survey sites. It is just NOT a bonus you will get by Panel Bucks and they are not responsible for any bonuses. So just so you are aware of this and do not expect to get $25 bonus as soon as you have confirmed your Panel Bucks membership. One more thing you can find on Panel Bucks is access to a so-called community. You can get access to a Facebook group. This is what revealed to me that Panel Bucks likely is owned by the same people that have SaySo4Profit and Panel PayDay. The reason for this is that they have the exact same community option and all of them lead to the same Facebook group. In my opinion, a Facebook group without much value. As already explained in this review, I do not think the quality of the offers you get on Panel Bucks is very high and it is more focused on promoting than giving you useful info. In my opinion, it is the exact same thing in the Facebook group. I would not really call it a community by just a promotional channel. Now you know more about what you really get access to if you join Panel Bucks. If it is not clear yet, I just want to make it perfectly clear here – you do NOT actually get paid on Panel Bucks. You can follow some of their links and recommendations and join other sites. On some of these sites you will then be able to earn but on some of them, you will just get access to more offers where you have to go to other sites. So you do NOT earn directly on Panel Bucks. Not that it is necessarily wrong or that you cannot get anything out of being a member then. But I just do not think it is transparent enough what to expect, and that is why I want to make it perfectly clear. By now, you definitely know that you will not actually make money on Panel Bucks. But how much money can you in general make, if you follow some of their recommendations and join other sites? Well, in my experience, the survey sites Panel Bucks promotes are far from the best survey sites. You can earn a bit on some of the sites but just remember that several of the sites it promotes are just other aggregators. So it will not give you access to huge earning opportunities and you can end up spending quite a lot of time testing the offers they recommend to find the ones that are actually worth it, in my opinion. Who can join Panel Bucks? If you still want to give Panel Bucks a try, then it is available in 4 countries. Panel Bucks is available in these 4 countries. However, if you live in other countries and really want to join, you can actually join from anywhere. 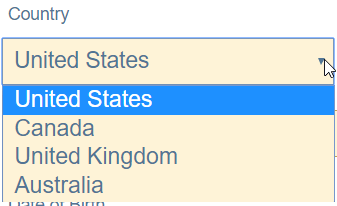 No matter where you live there are, however, better survey sites in your country, in my opinion. I always look into the opportunities to get support when testing survey sites. In the case of Panel Bucks, there is a contact form on their website you can use. Just be aware that they state that they will not respond to messages that have already been answered in their FAQ section. Personally, I have not tried to contact them so I do not know how responsive they are. So is Panel Bucks legit or a scam? Well, I have gathered all the info I could and tested it myself to help you make an informed decision about this. To help you get a better overview, let’s finish this review by summing up the pros and cons to help you decide. You can find a few survey recommendations on Panel Bucks that are worth following. You just need to be aware that you will not be able to earn on the site itself. In my opinion, the biggest problem with Panel Bucks is that it is not very clear what you can expect before joining and there is no real in-depth info to help you find the best options for you. And you can end up spending a lot of time finding actual paid surveys you can take as many of the offers it promotes are just for other sites that are collections of links. For these reasons, it is NOT a site I recommend. There are so many great paid survey sites you can join directly. You can, for example, check out the best survey sites in your country here. All of these are actual survey sites with earning opportunities directly on the sites and, in my opinion, better use of time as you know they pay and do not just send you to other sites. If you have any comments, questions, or have any experiences with Panel Bucks yourself, I would love to hear from you in a comment below. You can find a few survey recommendations by joining Panel Bucks, BUT it is important to know that you cannot earn on the site itself which might not be clear before you join. Also, several of the sites it recommends are just other sites with link collections so you can end up spending a lot of time finding the actual paid survey opportunities. That is why I recommend joining the actual paid survey sites directly instead.